I am just so delighted to be visiting with ya’ll today! I was so honored when Christy asked me to stop by and share one of my favorite recipes with you. As a blogger it is so much fun to get to work with other bloggers like Christy, she is what we call back home– Good People ;). So now the hard decision of what to share… what to share? 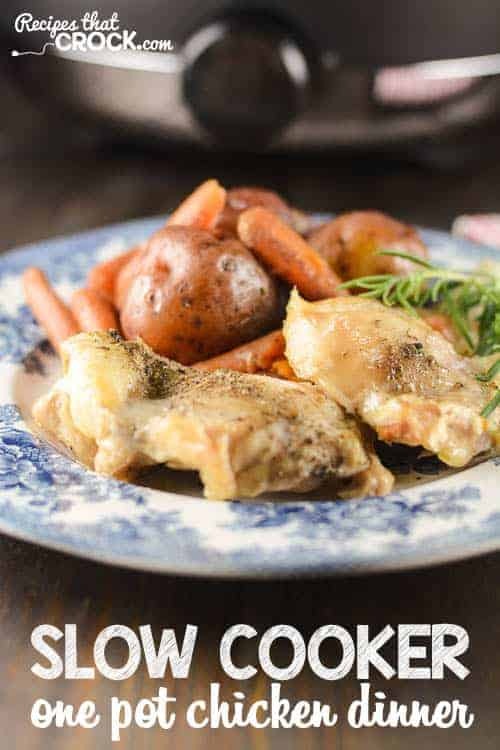 How about a recipe we make all the time at our house: Slow Cooker One Pot Chicken Dinner. As you might imagine, we make all kinds of slow cooker recipes at our house for our site Recipes That Crock! So, I tell my readers if I am sharing a recipe that we make over and over again, you know it is serious good. And, this my friends is SERIOUS good and so easy to throw together. We have made this a million different ways… with chicken legs, a whole chicken, different kinds of veggies, herbs, etc. 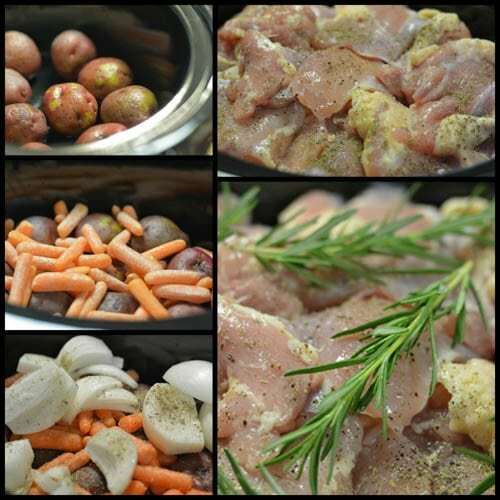 But today I am going to share my VERY favorite way with you– boneless skinless chicken thighs and fresh rosemary. Those thighs have just enough fat in them to crock up nice and juicy without drying out and I love me some rosemary! Truth be told, we cook with chicken thighs a lot on Recipes that Crock. From everything from Crock Pot Chicken and Rice to Slow Cooker Rustic Italian Chicken to the oh-so-yummy Crock Pot Fiesta Chicken and Beans, the chicken thighs are our secret weapon for great slow cooker chicken every time! This is one of those dishes that is purely dump and go and perfect every time. You simply layer your veggies, seasoning as you go and top with your chicken and herbs. As the chicken cooks up, the drippings make for a delicious broth that the veggies cook up in all day. Layer veggies in the bottom of your slow cooker. Pour in sherry or broth. Layer chicken on top and season with poultry seasoning and salt and pepper. NOTE: If you choose to make it with a whole chicken or chicken legs or thighs that still have skin on them, I like to broil them for a few minutes after they get done slow cooking to crisp up the skin a bit. I just lay them out on a cookie sheet and pop them under the broiler, watching them very closely so they don't burn. You can also pull them out and rotate them if you like. Big thanks again to Christy for letting me stop by! I sure hope you guys enjoy this dish as much as we do! 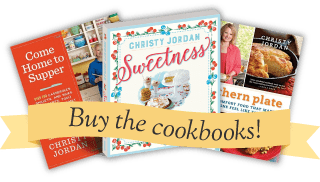 All Star Cornbread Recipe Potluck! Such a great choice for the crock pot! Love the recipe my crockpot is my number 1 way to cook meals. It never leaves a mess in the kitchen!! I love those mess-less meals too cat mom!! 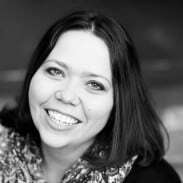 Welcome to Christy’s blog! I love this idea of stack and go chicken…lol! At my house this recipe is going to be perfect. I am a huge fan of chicken and my husband is a huge fan of potatoes….win win for everyone! LOL, I hope EVERYONE enjoys it Kay!!! Looks like dinner for tomorrow night! I hope you enjoy Kathy!! Can’t wait to try this recipe. With summer coming(we hope lol) I love recipes that use the crock pot when I’m busy in the yard or my garden. I am seeing signs that it is actually going to happen Dianne!! I am ready to be outside more myself!! This looks good and easy. I always do a slow cooker meal on Sundays, thanks so much for the recipe and I will be checking out your blog for more! I hope you get the chance to try it soon and enjoy it Constance!! Have a great day! Thank you so much for having faith in me Debbie!!! This looks like a great recipe, Cris. I’ll definitely be trying it very soon. I also appreciate your tip about broiling the chicken first if you’re using chicken with the skin on. I make another recipe in the crockpot with skin on chicken drumsticks and I always quickly brown them on the stove first. Silly me, I never thought to just pop them in the oven for a quick broil. That will be so much easier than the way I usually do it. Thanks so much for that tip and this recipe! Christy, good luck finishing the book. I’ve been keeping you in my prayers as you’re in that home stretch. We can’t wait to see it! We have this for dinner atleast twice a month a my family of 5 loves it!! Yes, you could use frozen thighs and it would work just fine!! Since my husband really doesn’t like dark meat I hardly ever cook chicken thighs so can this be made with breasts? I always have frozen boneless skinless chicken breasts in my freezer. And it sounds really good.